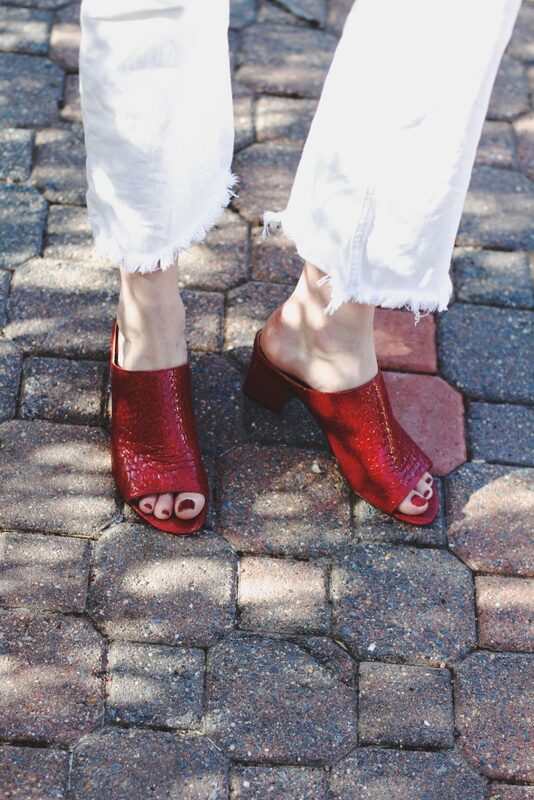 It’s pretty hard to deny that the mule is the shoe of the season and these candy apple red Donald J. Pliner mules are exactly what I was looking for to take me straight from spring through summer. The perfect heel height, eye-catching color (but not too crazy) – exactly what I need to dress up an outfit, but still be comfortable enough to walk around the city. I love how easily they spice up even the simplest of ensembles, like a classic button-down and white jeans. I wore this on a lovely evening when we took a family walk to SER – one of our local favorites (how pretty are their bar chairs?). Lately, we’ve been taking advantage of their weekend happy hour and making an early dinner of their delicious tapas – our favorites are the miniature chorizo cooked in cider and spicy shrimp! H&M jeans – on sale! Lol! I’m terrible with nails but I felt like these beautiful shoes deserved it! 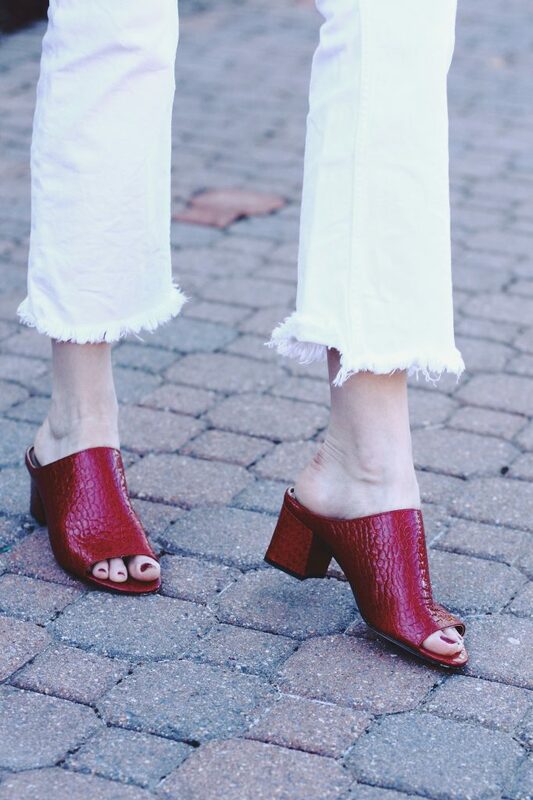 These mules are super cute and I love the white pants! Those mules are so pretty! Love the look! Mules are seriously so in. Love the colour of these. Such an amazing style! Lovely pics! The hem line of those jeans are so fun! I definitely need to check out those red mules too. Still loving these bold shoes!! I just love this time of year, so perfect for taking walks. SER sounds fantastic, I’m a big fan of tapas! Okay I really love those! I have been on the hunt for the right mule, but a lot of them are a little too wide for me. 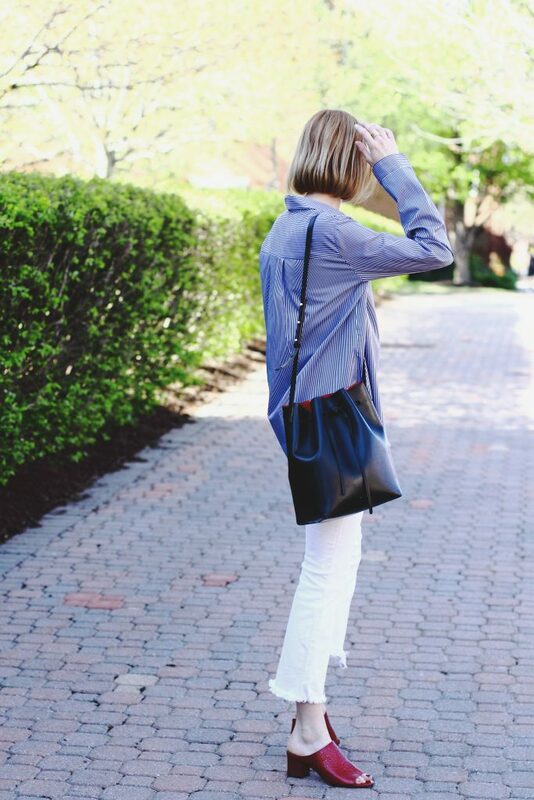 That color is perfect with your white denim and blue top. Chic as always! I am obsessed with the white trousers! That simple casuals looks are the best! really, not so many hour long efforts – only add right accessories! You styled it really good! I think this is the first red mule I’ve seen and I am just loving the statement they make!